Orrville sophomore Madison Monheim became the first girls swimmer in OHS history to qualify for the state swimming meet. She'll compete in the 200 yd Freestyle swim at this weekend's meet at the Branin Natatorium in Canton (right beside the Fieldhouse). She swam a personal best 1:56.47, good enough for a 7th place finish at Friday's Division 2 district meet at Cleveland State. 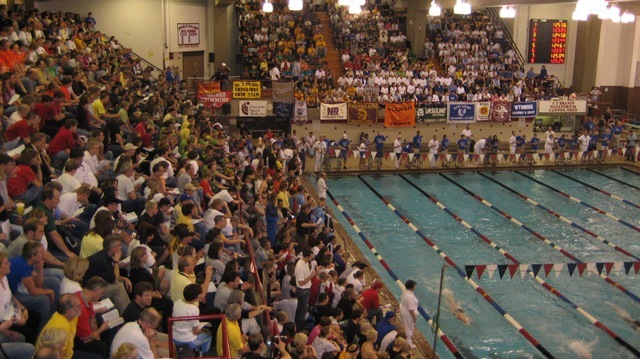 The top 3 finishers in each event earned automatic bids, and the next 11 fastest times statewide earned at-large berths. Madison earned one of those at-large spots. She's seeded 14th in the event and will swim Thursday night. If she's one of the top 16 times in the preliminaries, she'll return Friday evening for the finals. For what it's worth, she just missed qualifying for the 100 yd freestyle, by a mere .02 (two hundredths) seconds, and missed on qualifying for state last year by one spot as well. I had a post ready to go last week but it didn't publish on Friday (my mistake). I wanted to recognize all the girls who qualified for districts. Here's the list, how they qualified and how they finished. Congrats to all, and good luck to Madison. The night Kevin Summers went for 51 and 22.